I took this picture during my flight to Sao Paulo. 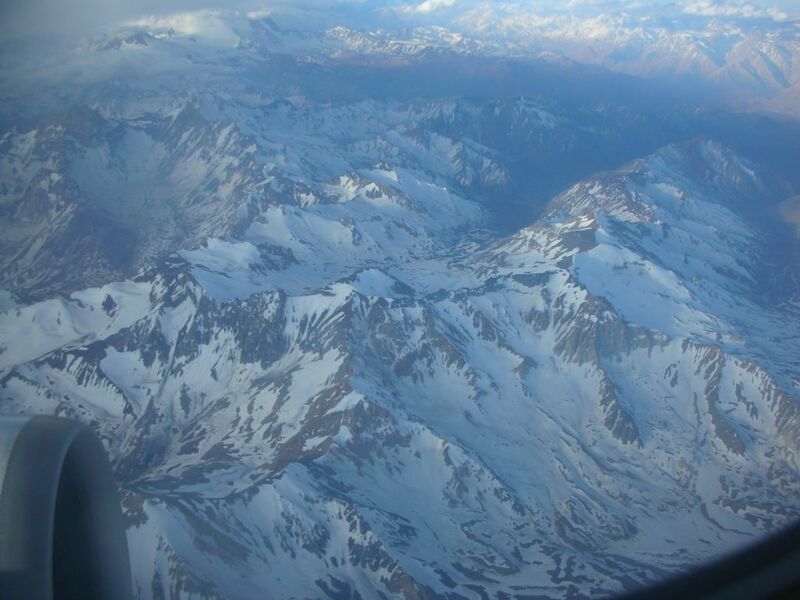 You can see the Andes Mountain Range from above, always snowy and majestic, when we were crossing to Argentina. Sao Paulo is less than four hours from Santiago... Definitely great for a weekend escape. What a beautiful view! Made the flight more enjoyable, I'm sure. Maybe it's a good thing you won't be in Santiago just now - I hear it's not very safe these last few days. I'm back already. And no, Santiago is always safe. The demonstrations they are showing these few days on TV are very isolated (a couple of blocks near downtown) and short. Chile is one of the safest countries in America. Wonderful! Very beautiful! How great the One above to create such a beautiful mountain! Magnificent mountains. Great capture through those airplane windows. Its nice to escape once in a while. I love that view and never get enough of it... great photo. Four hour flight for a weekend, seems a bit long for me! can't say anymore than that!